Did the Nasdaq Just Start a Prolonged Head-and Shoulder Decline? If it looks like a duck, quacks like a duck, and walks like a duck, it’s probably a duck. This could be trouble, because the Nasdaq looks like it’s at the beginning stages of a bearish head-and shoulders pattern. If it looks like a duck, quacks like a duck, and walks like a duck, it’s probably a duck. Unlike a duck, a head-and shoulders pattern is never fully confirmed until it’s completed. Nevertheless, the Nadsaq-100 and Nasdaq Composite (Nasdaq: ^IXIC) charts show a near perfect setup for a head-and shoulders top. 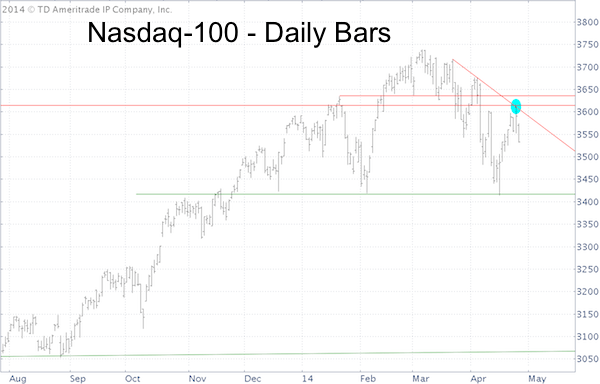 As the blue oval highlights, yesterday’s (Thursday) pop carried the Nasdaq right against double resistance, forming a potential right shoulder. Continued market forecasts are available via the Profit Radar Report. Thursday was a great day for Apple, an average day for indexes with some exposure to Apple, and a forgettable day for ex-Apple indexes. This raises the question: How strong (or weak) would this week’s market action be without AAPL? On Thursday the Nasdaq-100 (Nasdaq: QQQ) was up 0.96%, the S&P 500 (NYSEArca: SPY) 0.17%. But the Russell 2000 (NYSEArca: IWM) was down 0.24%. What’s the common denominator of this fragmented performance? AAPL accounts for 11.78% of the Nasdaq-100, 2.80% of the S&P 500, and zero of the Russell 2000. Thursday was Apple-day. The more Apple, the better. How would the broader market have fared without Apple’s boost? One way to find out is to look at the equal weighted Nasdaq-100 ETF (QQEW), which was down 0.01%. 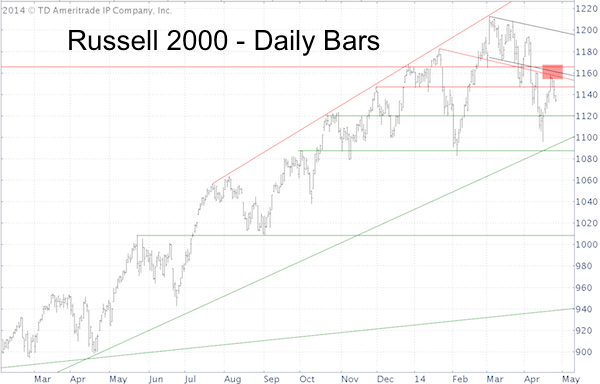 Another way to find out is to look at the Russell 2000, although representing a different market segment (small caps), which is totally Apple free. 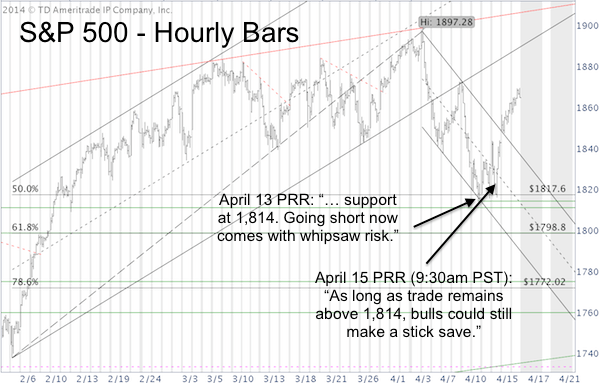 The Russell 2000 was rejected by resistance cluster at 1,147, 1,160 and 1,165. The performance of lesser or non-Apple exposed indexes cautions that the broad market is weaker than it appears. Did the Nasdaq Just Start a Prolonged Head-and Shoulders Decline? Could Nasdaq VIX ‘Saucer Break down’ Lead to Waterfall Decline? The Nasdaq VIX is ‘climbing up saucer support.’ This pattern is quite rare, but has some prominent precedents: Silver and gold in 2011 and Apple in 2012. Could a Nasdaq VIX ‘saucer break down’ lead to a similar decline? When it comes to VIX instruments, the S&P 500 VIX gets all the attention, while the Nasdaq-100 VIX (VXN) is treated like the ugly duckling. Right now the ‘ugly duckling’ VXN chart looks more interesting than the S&P 500 (NYSEArca: SPY) VIX. Since mid-November VXN has been in a steady up trend. Since the beginning of the year, VXN is climbing along bowl or saucer-shaped support. Resistance at 22-24 has capped every VXN rally. From November – March the VXN has rallied alongside the Nasdaq-100 (Nasdaq: QQQ). In the technical analysis universe, the bowl-shaped support is quite rare and the actual support level is harder to pinpoint than straight trend line support. Nevertheless, I’ve seen three asset classes ‘climb up the saucer’ before and tumble thereafter. 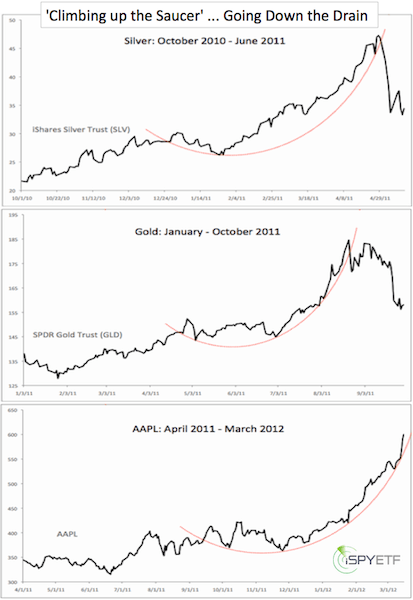 Silver in April 2011, gold in September 2011, and Apple in April 2012 (see chart below). Gold, silver and Apple climbed up the saucer during the late stages of a bull market frenzy. 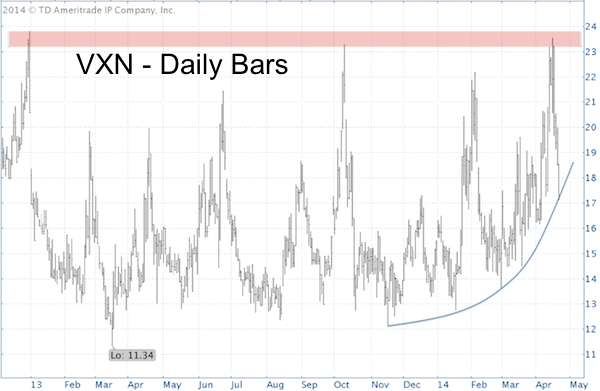 VXN’s rally has been short and comparatively tame, therefore VXN’s reaction to a saucer breakdown may be much more subdued. This is one of those formations that doesn’t jibe with the majority of my indicators right now. Most of my indicators are suggesting that risk is rising. The Nasdaq for example may be crafting the right shoulder of a bearish head-and shoulders formation, but a VXN break down would translate into a higher Nasdaq. Datapoints like this remind us to never be complacent. 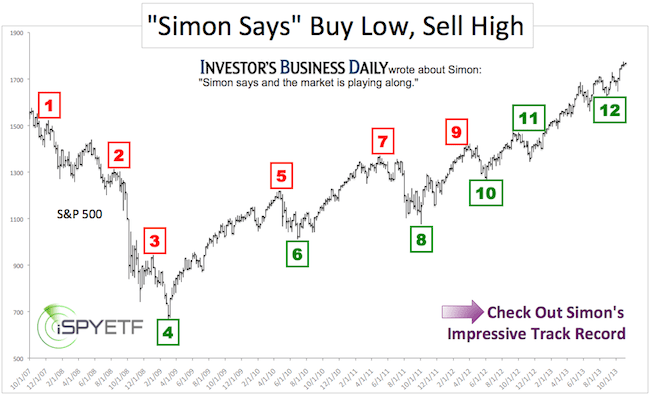 On April 14, when the S&P was at 1,820, I wrote an article titled “This Might be the Only Bullish S&P 500 Chart Right Now,” and we now know that this chart prevailed over many bearish indicators. Based on a recent poll, investors feel strongly that this bull market is coming to an end (or has already ended). Ironically, this kind of conviction is usually fertile soil for a continuation of bull markets. Both of those clichés will certainly catch up with this bull market. In fact, retail investors appear ready to bury the bull right now and slap an RIP sign on it. 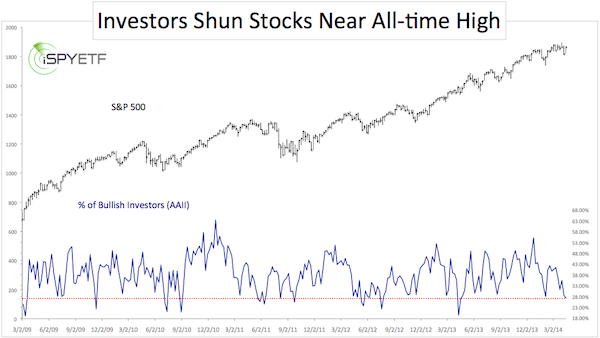 Based on the latest AAII (American Association of Individual Investors) poll, not even a complimentary 9-foot pole would entice retail investors to ‘touch’ stocks. The chart below plots the percentage of bullish investors polled by AAII against the S&P 500. Last week only 27.22% of polled retailed investors were bullish on stocks (red line). That’s unusual considering that the S&P 500 (NYSEArca: SPY) is still within a few percent of its all-time high. The AAII poll is not the only sentiment gauge around. In my humble opinion it is actually one of the most volatile and least accurate gauges. Nevertheless, ignoring it would be as shortsighted as elevating it to a fail proof indicator (the Profit Radar Report publishes a full panel of sentiment gauges once a month). The simple truth is this: Nobody rings a bell on the top. Major peaks come as a surprise and a top right now would be the first one in history to be foreseen by retail investors. Don’t get me wrong, I believe the S&P 500 and cohorts are due for a correction, but bulls will continue to torture bears. One of those ‘torture instruments’ may be new all-time highs (followed by a correction?). One exotic technical indicator that suggested a bounce at S&P 1,814 points towards new all-time highs. Stock market bears had a ‘do or die’ chance to take the market lower, possibly much lower, … but they fumbled it. Now bears are back in a dark corner and need to take a stand almost immediately to avoid new all-time highs. This can’t be said for stock market bears right now. When presented with a chance to push stocks lower, bears cave under pressure and fail to ‘grab the bull by its horns’. Earlier this week bears had such a chance to knock the bulls off their throne (at least temporarily) and unlock significantly lower price targets, but they didn’t. Like in a competitive sports game (imagine football, soccer, tennis, etc.) there’s often one pivotal moment – one missed chance – that turns the game. The bears had such a chance at S&P 1,814 on April 14. Why was 1,814 so pivotal? 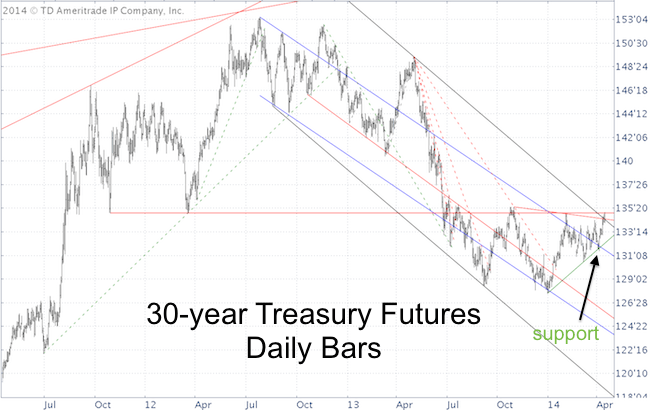 1) It was a confluence of technical support levels (trend channel support, Fibonacci support, and supply/demand support created by November/December highs and lows). 2) Based on Elliott Wave Theory (EWT), the S&P declined in only 3 waves (from April 4 high to April 11 low). Admittedly, EWT is one of the more exotic tools in our technical analysis toolbox, but it can be helpful. A 3-wave move suggests that the larger trend (which is up) is still in tact. Quite frankly, I thought that bears would take care of business this time. But what the charts say is so much more important than what I think. 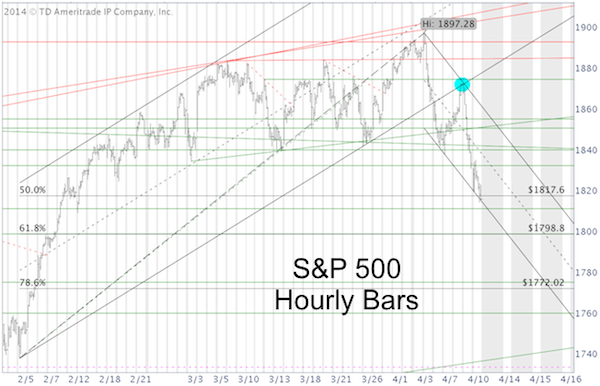 As the updated S&P 500 chart shows, the S&P gapped above the channel and never triggered a short signal. As the headline brings out, bears need to make a stand almost immediately; otherwise new all-time highs are possible, even likely. 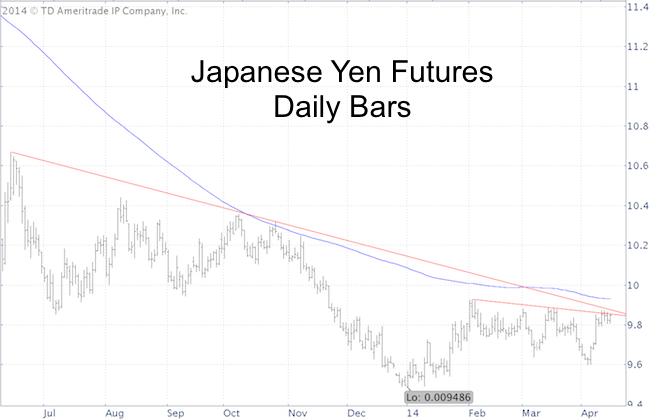 The key resistance level, that once broken, should lead to new all-time highs and a more detailed short-term forecast is available via the Profit Radar Report. Mirror mirror on the wall, which is the fairest day of all? A curious statistic shows that the strongest day of the week captured 75x the 2014 S&P 500 gain. While this may be a nuisance stat, there’s also a more helpful one. Trading at 1,850, the S&P 500 is up 0.09% year-to-date (YTD). If Wall Street were only open on Tuesdays, the YTD S&P 500 (NYSEArca: SPY) gain would be 6.80%. In 2014, Tuesday is the only profitable day of the year. The first chart shows the S&P 500’s YTD performance in daily bars and percentage. 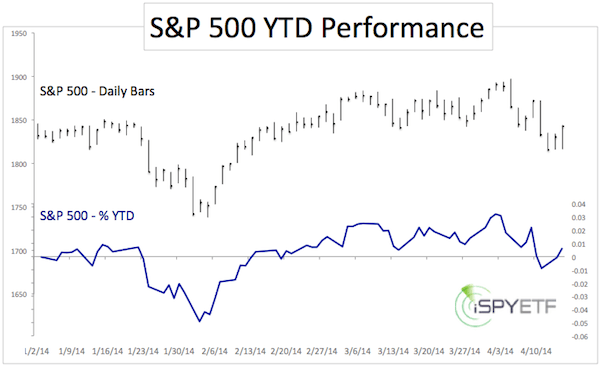 The second chart shows the S&P 500’s performance by day of week. Why do Tuesdays hog all of the gains? Who knows? We do know that this is a 2014 phenomenon. Historically, Wednesday is the best day of the week (by a small margin) and Monday by far the worst day of the week (based on data going back to 1952). I would categorize this anomaly as curious, not predictive. But there are other incredibly helpful patterns. For example, historical price action shows strong bearish seasonal forces arriving in April.